You’re looking to use Facebook Ads to generate new leads and expand your brand awareness. You’ve read up on all of the best practices, ad strategies and mistakes to avoid. But what exactly does a good ad look like in comparison to a bad one? The best way to learn is to look at real-world examples. I’m going to breakdown 10 Facebook Ads for you with what I like and what I would change or test for a higher click-through rate. Before we start critiquing, let’s break down the different parts of a Facebook Ad. 1. The Body Text: Located above the ad, the body text provides the basis of what the business is advertising, or what their offer is. It serves as a brief introduction to your ad, giving them just enough info to make them want to read the rest of the text. The Image Text: Often times businesses choose to include text over top of their image if they want it to stand out boldly as they have done in purple in this ad. Using an ad with text in it allows you to convey another message or re-emphasize part of your message. The Image: News Feed and Sidebar Ads both provide you with the opportunity to upload your own image to visually convey what you are trying to promote and to grab users’ attention. The Headline: This text (up to 25 characters) below the image or next to the image is larger and more obvious than the other text sections, and clearly describes the most important piece of information to users. It should be the text that will grab users’ attention as they scroll through their Facebook Feed. The News Feed Link Description: The link description gives you up to 200 more characters to give additional information and details about the offer or product/service and describe what users will gain access to by clicking through. The Image: It has been proven that the best image to use in Facebook Ads is a smiling woman looking directly at the camera. With that being said, CDI College has nailed it on the head. The image is friendly and inviting and the woman looks genuinely happy to be studying nursing, conveying satisfaction with the program. The Bright Headline: The bright purple headline on the image stood out boldly when scrolling through my Facebook News Feed. This is also well aimed at their demographic, considering purple is the favorite color of 23% of women. 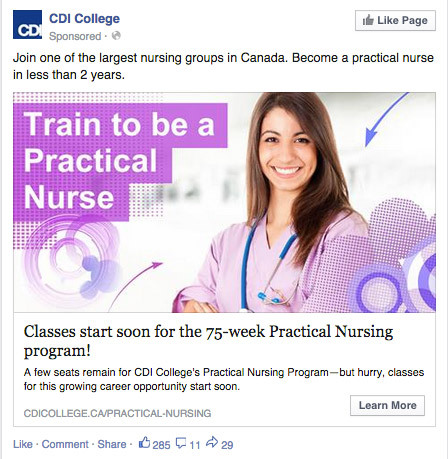 By having “Train to be a practical nurse” on the image, it is much more attention-grabbing than the typical Facebook headline. Urgency Use: By using urgency words in the body of the ad, CDI makes users rethink waiting until a later date to sign up for this program. The copy that reads “a few seats remain” and “but hurry” convinces users want to act now, before it’s too late. The Directional Cues: The directional arrows in this ad’s image are confusing and unnecessary. When I first saw this ad I spent a long time trying to figure out what exactly the pink and purple arrows were pointing to. Instead of directing users’ eyes to the woman they should be directed at the CTA, in this case the “Learn More” button. Not Much Else: I think this ad is fantastic. Many colleges and universities create boring, bland ads but this is quite the opposite. It’s hard to miss scrolling down the page, and uses ad image and text best practices. The Headline and News Feed Link Description: To a new parent this ad would stand out and grab their attention. 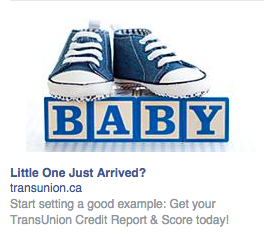 It’s smart of Transunion to target this segment for credit reporting as it’s something they may be reconsidering with a new addition to the family. If you were a new parent and saw baby shoes and blocks reading “baby,” it’s fairly likely it would cause you to take a second glance. 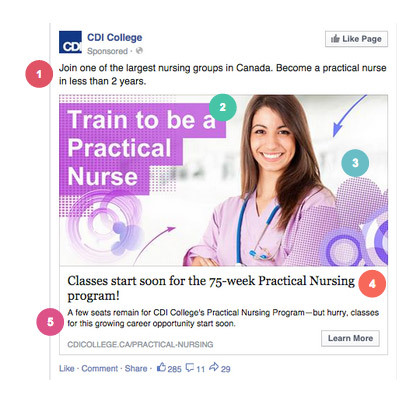 The Image Colors: Using blue and white as the colors for your ad is a big Facebook no-no. As most marketers know, you want to avoid these two colors when creating your ad, as they blend in with the Facebook interface and background. They should try using green, red or pink which would be more eye-catching and attention-grabbing on users’ sidebar. The Targeting: This ad actually appeared on my co worker James’ Facebook sidebar, which we found interesting considering he is not a new father. He has nothing on his profile to suggest he is a father, so Transunion is wasting money by mistargeting someone who is not a new parent. Scrolling down the page an image and text about a new baby are not going to stop a non-parent in their tracks. To those who are mistargeted it comes across as an unprofessional mistake and it’s highly unlikely they will be clicking through. The Seasonal Theme: I came across this ad the week before Christmas, so I like how Telus has used the holiday theme to capture users’ attention. 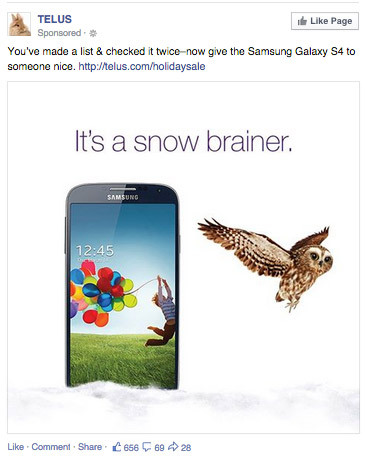 They have done this in the body text of the ad with “you’ve made your list and checked it twice–now give the Samsung Galaxy S4 to someone nice.” This caption is witty and clever, and the holiday rhyme may give users that extra push to click through. The Headline: Including the large text “It’s a snow brainer” makes the ad more eye-catching as it stands out from the white background. It’s also a clever title, consistent with the snow and snowy owl in the image. The Image: Sometimes gadget brands struggle to make their product stand out in ads, however Telus has made the Samsung eye-catching with a bright colorful phone lockscreen. Against the snowy white background, users’ eyes are drawn directly to the phone, making it clear what Telus is advertising. The Ask : A user on Facebook has not shown any intent to purchase a new phone from Telus. For that reason, asking for users to purchase right off the bat is a very large ask. Telus should instead have a smaller ask with their Facebook Ads to get their initial interest. The Background? : Normally my Facebook Ad instincts would say to avoid using a white background on your image, but in this case the white makes the other features like the owl and the phone stand out. The Offer: Using Facebook to offer a coupon is a great practice to gaining new signups and maximizing your click-through rate. Users love being able to get the coupon code and discount all in one place, and Facebook is a great place to create awareness about your current promotion. 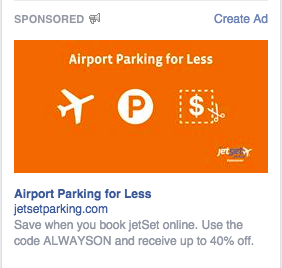 The Image: On a News Feed Ad, you’re paying more to get more space to promote your business. 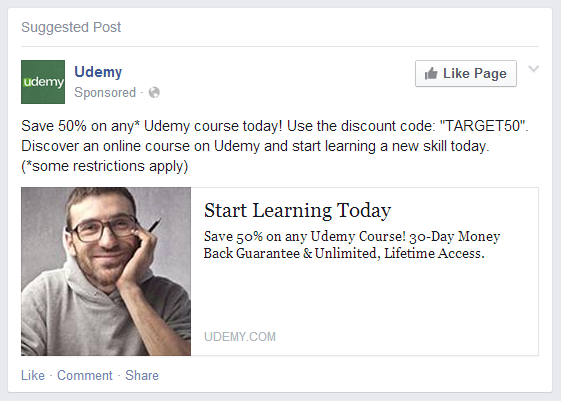 Udemy has chosen a good image, but it is too small making their ad appear cluttered and dominated by text. On first glance all you see is text, which is always a bad factor for conversion. Using a larger image would make their ad stand out more from the other posts on a user’s News Feed. A Call-to-Action: With a larger, more prominent image, it would also be helpful to have a CTA with this ad. While they do have the CTA that reads “Start Learning Today” it doesn’t stand out amongst all the other text. Having a brighter, bold CTA button such as “Start Saving Now!” or “Sign Up now!” on the image would give users an extra push towards taking action and signing up. The Image: As most travel companies do, Westjet has nailed the image on the head by using a desirable photo that would make anyone want to convert. White sandy beaches, tropical water and sunny blue skies in the dead of winter is definitely enough to make me click through. The Headline: Using a catchy phrase that plays off of a classic movie line is a great ad move. 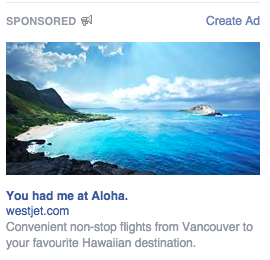 Its humorous but also conveys the message of the ad, focusing on the company’s Hawaiian destination. The Body Text: It plain and simply explains the message of the ad, using convincing words like “convenient” and favorite” to hint at the user’s need for a vacation, persuading them to click. The ad text is also personalized to me, as a Vancouver resident, making it more appealing and relevant to my vacation needs. The Colors: While it’s hard to avoid when showing clear skies, beaches and water, Westjet should be careful using images with so much blue and white, as they tend to blend in with the Facebook theme. They could possibly look into using a similar desirable image that also includes some other colors as well to make it stand out even more. A Call-to-Action: Westjet may benefit from adding a CTA to their body text such as “Find my flight!” to persuade users to take immediate action. The Color: Orange is a great color to grab the attention of users. Normally one’s Facebook News Feed has few orange features or images, so it’s always a good choice. The Icons: The 3 icons together perfectly convey airport parking for less, their image text. Without the text you would still be able to tell what this image was trying to convey. The Offer: Using a coupon in your Facebook Ad is a great practice as it’s an offer that leads can convert on and use immediately. The Body Text: It’s clear and simple, giving the coupon code and stating the percentage savings so there is no guessing involved for users. Call-to-Action: A great sidebar ad, but I would consider adding a CTA such as “Get my coupon” or “Save now!” to convince users to click through and move them towards conversion. 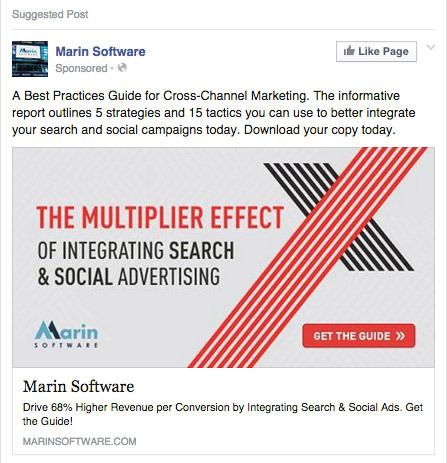 The Image: It’s clear from the image what Marin is trying to promote as they have used bold, multi colored text. The red especially stands out scrolling through a Facebook News Feed, capturing users’ before they keep scrolling by. The large X feature also conveys the “multiplier effect” topic and is consistent with the text. The News Feed Link Description: I like how Marin has given a specific stat to show realistically the change you could experience by reading their guide and integrating their ideas. They have given a benefit to the user, rather than simply listing a feature of their guide. They have also placed a call-to-action at the end of this text, providing an extra push to conversion. The Amount of Body Text: When I first saw this ad I was immediately overwhelmed with the amount of copy used. It’s hard to scan or even read as they have squished so much information into such a small area. I would definitely reduce the copy at the top to two lines as a maximum. Facebook ads are not where you want to convey all of your copy to users at once. By also using text in their image, the ad is simply too text heavy. The Body Text: Thinkific has properly conveyed their unique selling proposition in the body of their ad, while also using the word “thousands” to convey social proof. I also like the last sentence saying “Be a part of the next generation of learning” as it also makes users want to convert to avoid being left out of this new concept their peers are using. The Call-to-Action Button: The peeled up page on the image is a clever way to catch user’s eye and make sure they see the CTA. The Image Text and Headline: The text on the image, “Expert, Author, Speaker? Teach courses on your own site” stands out from the blue background and simply explains what the platform does without confusing or overcomplicating the service. The headline below the image “Create and launch online courses on your own site” is also plain and simple, re-emphasizing the image text. The Image Color: While I do understand that blue is the theme color of Thinkific’s platform, they should try and avoid using blue and white on the Facebook platform. While it is a lighter, brighter blue, it does still blend in and could easily be looked over. 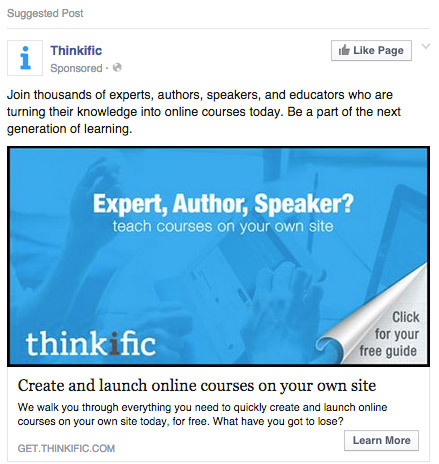 The Free Factor: Thinkific is a free service where you can create courses to host on your website. When offering a free service, you need to make sure users understand that it’s free from the get go. Thinkific should emphasize this point more in their ad as it’s a strong convincing feature to converting, and will help maximize their click-throughs. The Body Text: Dropbox has smartly presented their offer right away to users for free. It’s great that they have stated it’s free, and could possibly even make it stand out more by bolding it or placing it in all caps. I also like how they have followed their offer sentence with one outlining 3 different benefits the user will gain by converting. The Headline: Dropbox has properly used keywords that stand out to potential leads looking for a business solution. By including “proven” “secure” and “skyrocket collaboration” this headline grabs the attention of those in need of this type of solution. 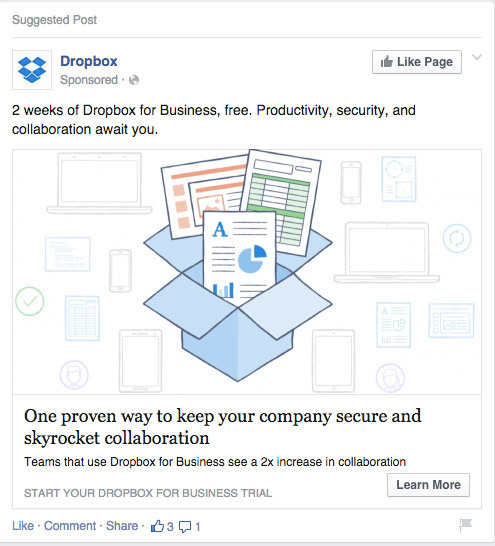 The News Feed Link Description: It’s great that Dropbox has used a statistic to show social proof. Having copy that says others see double the collaboration is good motivation to convince others to convert. The Image: While the image is consistent with the message Dropbox is trying to convey, the colors are too dull to stand out. Using pale blue, grey, green and orange makes the ad less noticeable to users. Dropbox should try using a brighter background color that is not blue or white, that will better grab the attention of potential leads. Hmm…unfortunately not a ton. 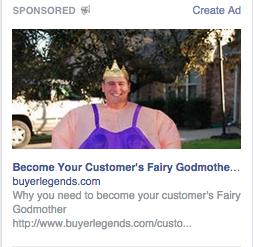 I think Buyer Legends has a great opportunity here to better utilize this Facebook ad. The Image: The idea of going for something weird and unique to grab Facebook user’s attention amongst all of the other noise is a great one. But this isn’t a great example. Seeing a man with a crown in a dress comes across as confusing as it’s not actually related to the business at all. On first glance I thought it was for a costume company or something of that nature, not a B2B company that looks after your customers for you. The Body Text: It also follows the fairy tale theme, giving no benefits to the user of why they need Buyer Legends. When you have this small amount of text, give users new information that will convince them to convert, rather than using useless text. When looking to expand your business’ brand awareness and generate new leads, Facebook Ads is the perfect solution. But, you must make sure you’re following ad best practices to grab users’ attention without overwhelming them with too much text or information. It’s time to make sure you’re optimizing your ads to maximize clicks.